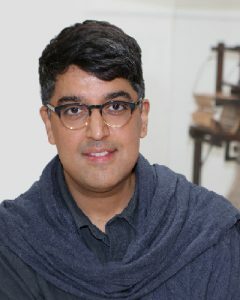 Isaac Facio specializes in textile technology with an emphasis on 3D woven structures and the development of new mechanisms that challenge the formation of solid cloth forms. He brings this focus to textiles and textile structures to collections care, preventative conservation, and exhibitions as part of the Textile Conservation staff at the Art Institute of Chicago. Isaac studied at the École Nationales Supérieure des Beaux-Arts in Paris, France, and is a graduate of the School of the Art Institute of Chicago. He received a Master of Science in Textile Technology from the School of Materials, Engineering and Physical Sciences at the University of Manchester, UK. He can be reached at isaac@fabricoftheuniverse.org. 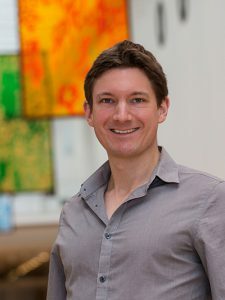 Benedikt Diemer specializes in computational astrophysics, meaning that he runs and analyzes large computer simulations. His research interest is structure formation, the gravitational collapse of matter in the universe into the structures we observe or infer today, such as galaxies and dark matter halos. He received a PhD in Astrophysics from the University of Chicago and a Master of Physics from the University of Manchester, UK. He is a post-doctoral research fellow at the Institute for Theory and Computation (ITC), a subdivision of the Harvard-Smithsonian Center for Astrophysics (CfA) at Harvard University. More information can be found on his website, and you can reach him at benedikt@fabricoftheuniverse.org.